Emma Norsgaard Jørgensen took up cycling jealous of the success of her brother but has since confirmed herself as a rising star in her own right. 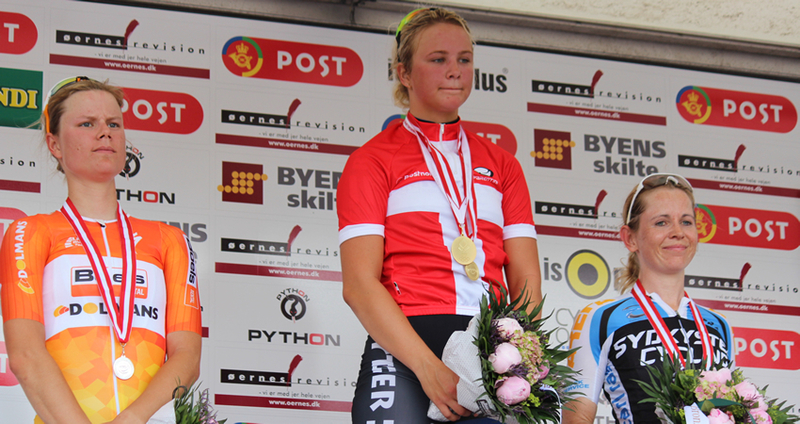 In 2015 before she even entered the junior category, Norsgaard Jørgensen surprised the field in the elite road race at the Danish Championships to finish second behind dual junior world champion Amalie Dideriksen. Despite adding a silver medal at the European Youth Olympic Festival to her name in 2015, Norsgaard Jørgensen lined up at the 2016 Championships thinking she didn't stand a chance. Part of a select group coming to the line the 17 year old unleashed her sprint to reverse the 2015 result edging Dideriksen to second. From there it was a quick switch to the track bike for the UCI Junior Track World Championships in Aigle, Switzerland. In just her second ever track event the young Dane finished fourth in the points race on the opening day, filling her with confidence for the omnium later in the week. Initially disappointed with her results in the omnium Norsgaard Jørgensen now sees her seventh place finish as good experience for 2017. Before then the UCI Road World Championships in Qatar are calling. With a perfect course for the rising sprinter Norsgaard Jørgensen is hoping for a top 10 finish, but knows the combination of heat and limited experience racing against the top juniors in the World will be her biggest challenge yet. I started because of my brother. I was so jealous of all his medals and success, so I started when I was 8-9 years old. Did claiming silver medals at the Elite Danish Championships and European Youth Olympic Festival in 2015 give you confidence heading in to your first year in the under 19 category in 2016? Yes it did definitely. Because of these results I started believing more in myself and so did my trainer, who by the way is my brother. Heading in to your National Championships this year what were your goals? After finishing second last year did you have higher expectations? Actually my expectations were not that high. The strong team BMS, from Denmark, was at start with nine strong riders, so I didn't think I could stand a chance. But the luck was by my side, and lucky for me we did finish in a sprint, which is my strength. How did the race play out for you? Coming in to the finish as part of a select group what was going through your mind? Coming to the finish in the leading group, a lot was expected of me I think. But actually I was really calm in the last few hundred meters. Simply because I didn’t had any expectations of myself, I hadn’t expected to win – so I was really calm but still focused. What does it mean to be the Danish national champion? Does winning the elite national title while still a junior and beating experienced professionals make it even more special for you? I think it really means so much! I am so happy about my new title as Danish champion, and even cried when I crossed the finish line and at the ceremony of the Danish champions jersey. It was an unreal feeling, so I was and still am really happy to have won the race. Less than a month after winning the national title on the road you were racing on the track at the Junior World Championships in Switzerland what were your goals? Finished fourth in the points race on the opening day did a strong result give you confidence ahead of the rest of the week? It was a really hard race the points race the first day, so ending fourth definitely gave me some confidence. You started the final omnium points race in ninth were you happy with how you had raced so far and what was your plan for the points race? I was so disappointed by my omnium results. I failed in the races were I should have showed some results, but looking back at it now, I think it's an okay result. Took a lap and picked up a few sprint points to move to finish seventh how did the points race go for you? I took a lap and some points in the last point race, and that was the plan from the start. My other results weren't impressive, and before the last race I was number ninth, so I had nothing to loose, so as my trainer would have said - "You just go full gas." Your best result in the omnium was fourth in the IP among a strong field. Is the IP your favourite event? It’s funny because actually the IP used to be my least favourite event. The other starts in the omnium suit me a lot better. I just managed to mess them completely up, so it was a good thing that I finally could make a fine result in the IP. Overall were you happy with your performance in the omnium? As I said earlier right after the race and even some weeks after the race, I was so disappointed by myself. But when I look back at it now, I think I should give myself I little bit more credit for my results. I just wish for better luck and legs for the next World Championships. How do you find combining road and track? What do you find to be the biggest challenge moving between the two disciplines? My trainer and I have found a fine combination between road and track. But it hasn't even been a problem at all, because I had only raced one track race in January before I went for the Worlds. So it was not much of a challenge. You have been selected for the Road World Championships in Qatar a flat course but always plenty of crosswinds what do you think the biggest challenges will be? My biggest challenges will without doubt be the heat. I find it hard to make my body perform in heat, as in Qatar. But hopefully I will manage because the course is absolutely perfect for me. Have shown you have a very quick sprint and with Worlds on a sprinter friendly course what are your goals? I think its so hard to say what my goals will be for the Worlds, because I don't know the half of the girls I will meet. But I hope for a top 10. Looking ahead to 2017 do you plan to continue to combine track and road? As it seems right now you can't get rid of me just yet on the track and I will be back again in 2017.